As we race towards a technological renaissance, we find ourselves more vulnerable than ever to a great cosmic power, writes James Fitzgerald. Techies around the world would have been hard-wired for insights last week as the DLD17 conference in Munich and the World Economic Forum (WEF) in Davos ran concurrently. The former – populated by academics and innovators – was marked by a frisky anticipation over technological possibilities, while the latter – made up of politicians and business leaders – succumbed to fear and uncertainty over global events, even as the sun shone outside. Chinese premier, Xi Jinping, speaking in Davos, said: “Unlike the industrial revolution, our fourth technological revolution is unfolding at an exponential, and not linear, pace”. One statistic that came out of the meeting was how Hollywood box office takings have been outpaced by App revenues – even though they didn’t exist before 2008. Premier Xi opened his address with a quote from Charles Dickens: “It was the best of times, it was the worst of times”, to highlight the many contradictions facing modern society. We stand poised to tip the technological scales between wisdom and foolishness, amid both belief and incredulity, to evoke Dickens once again. One of the aspirations alighted upon at DLD17 was how to “democratise” artificial intelligence (AI) for everyone. In what seems like the blink of an eye, learning machines have gone mainstream. “This is the year where AI is no longer just a computer science problem,” Joi Ito, director of the Massachusetts Institute of Technology’s (MIT) media lab, said at the WEF. “In a world where there becomes an abundance of AI, what might become scarce is common sense and empathy,” Satya Nadella, the CEO of Microsoft, told the audience in Munich. In Japan, for every 10,000 workers, there are already 1,500 robots, warned Bill Gross, the founder of the Idealab incubator, while Sharon Weinbar, writing in the Huffington Post, claims there will be 1,000,000 unfilled software engineering jobs in the US by 2020. And yet McKinsey, the consultancy, says that the work of 1.1 billion people can already be automated. Some confusion and disruption is clearly ahead of us, but the question being asked now is, how organised and managed will it be? The United Kingdom government has just reiterated its desire to create “without further delay” a Robotics and Artificial Intelligence Leadership Council, which would formulate a national RAS strategy for “this great technology”. It has asked the Royal Society and the Alan Turing Institute to look at “social, ethical and legal questions, to ensure the development of these technologies fully benefit society”. In November last year, Prime Minister Theresa May announced an extra £2bn for research and development (R&D) into “priority technologies”, under a new Industrial Strategy Challenge Fund. “This includes taking a leading role in high-growth areas, such as service robotics and robotics in hazardous environments, and supporting greater integration across hardware, software and cross-cutting technologies,” said a report to the UK Parliament Science and Technology Committee. That sounds like good advice, if Professor Stuart Staniford of Cornell University is to be believed. He says robots may outnumber people within 15 years. As robot production continues on an exponential track – while population growth stays close to linear – a war is brewing between drones and robots. Ahti Heinla the founder of Starship Technologies, a UK start-up that builds delivery robots that can carry medium-size packages and grocery bags, claims that the efficiencies of online shopping stop at the delivery van. Two of the main pioneers in air delivery are Google parent Alphabet Inc and Amazon, which are still testing drones. Even so, it is robots that rule the roost in Amazon warehouses, where the number in 2016 increased by 15,000 from the year before. Airbus’s CEO, Tom Enders, told DLD17 that they had been developing an autonomous vertical take-off and landing concept – or flying car – to alleviate urban congestion. Nasa, the United States’ space agency, has expressed its aspiration to have robots working safely beside humans in space – perhaps carrying out hazardous tasks. We are indeed boldly going where no man has gone before – and at warp drive. There may be an ideological schism developing in society, as in Dickens’ time – between those who “believe” and those who remain “incredulous”. To some, the blistering pace of technological innovation provides a ray of hope in an otherwise uncertain world, but other technologists warn that a different kind of light can be shone on the subject. 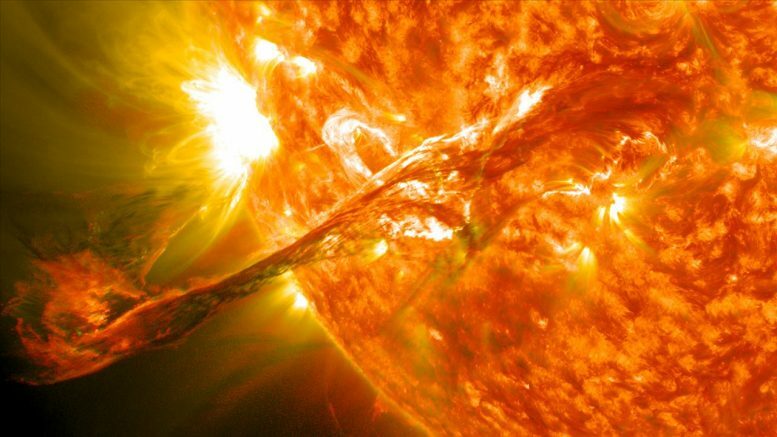 Sunna-Wedra has developed an early warning system that would increase the response time on damaging solar activity – what astrophysicists call coronal mass ejections (CME). These CMEs can travel at more than 2,000km/sec and affect electrical grids on Earth, potentially short-circuiting power plants, machinery and aviation. The German start-up proposes to site eight space weather satellites in a V formation at a distance of between 2m to 8m kilometres from the planet in the Sun-Earth line, providing a time advantage of over 400 per cent compared with existing systems. Nasa currently has two satellites in the Sun’s orbit, although the STEREO-B craft is offline. The second satellite, STEREO-A, continues to monitor the far side of the Sun. During a worst case scenario, even five more minutes’ notice would allow vital infrastructure to be disconnected from electrical grids, says Denise Jones, the technical director. An Australian company is poised to build the propulsion system, which would use an ion drive system, with enough power to allow for stationary positioning in space. The craft would then rotate every two to three years. Ms Jones says she has had “friendly” and “encouraging” discussions with large aeronautics groups, who are waiting for a second “proof of concept” study to be completed. The company is seeking €300,000 in funding to embark on the next phase of development. “This is the big data company everybody is looking for, but it’s been hard for us to explain such new ideas to people,” says Mr Bolduan. Sunna-Wedra proposes to offer an app that would provide live updates and warnings on solar winds to everyone – bypassing conventional astronomers – another example of data democratisation for the masses. Given the small time windows to react, who could object to a sat-to-app interface for the man in the street? Ms Jones says the Sun is currently at the low point of its 11-year cycle of activity. “It’s not a case of if, but when a strong CME hits, with the potential to not just damage services, machinery and AI, but destroy it,” she says. It may be that society is not being ambitious enough in its pursuit of technological transcendence. Ever since the post-war era, whispers have been heard on the periphery of mainstream science – of clean and free technologies. Mythical and nebulous concepts – such as centrifugal mercury propulsion and zero-point energy – would probably be less susceptible to cosmic radiation than our current plugs and sockets. Modern societies are, by their very nature, compartmentalised; access to knowledge and training is often conditional on accepting the contemporary paradigm as a given. Mavericks who try to see the world differently are often perceived as unwelcome disruptors. Yet when technology is leading society through a period of great change, the mavericks have an important role to play. In the quantum universe, for example, demands and restrictions on what is considered possible are anathema. To truly benefit from technology, we need to start thinking outside the box. Technology and human evolution would seem to go hand in hand. But parochialism and narrow vested interests remain as bugs in the system. “One for all, and all for one,” pleaded the embryonic AI baby in the womb of its technological masters – but don’t necessarily create me in your image.